Not to be confused with Potassium chlorate. "KCl" redirects here. For other uses, see KCL (disambiguation). The majority of the potassium chloride produced is used for making fertilizer, called potash, since the growth of many plants is limited by potassium availability. The two main types of potash are: Muriate of Potash (MOP, Potassium Chloride) and Sulphate of Potash (SOP, Potassium Sulphate). While SOP typically sells at a premium to MOP, the vast majority of potash fertilizer worldwide is sold as MOP. Potassium is vital in the human body, and potassium chloride by mouth is the common means to treat low blood potassium, although it can also be given intravenously. The intravenous form is on the World Health Organization's List of Essential Medicines, the most important medications needed in a basic health system. It can be used as a salt substitute for food, but due to its weak, bitter, unsalty flavor, it is often mixed with ordinary table salt (sodium chloride) improve the taste to form low sodium salt. The addition of 1 ppm of thaumatin considerably reduces this bitterness. Complaints of bitterness or a chemical or metallic taste are also reported with potassium chloride used in food. As a chemical feedstock, it is used for the manufacture of potassium hydroxide and potassium metal. It is also used in medicine, lethal injections, scientific applications, food processing, soaps, and as a sodium-free substitute for table salt for people concerned about the health effects of sodium. It is used as a supplement in animal feed to boost the amount of nutrients in the feed, which in turn promotes healthy growth in animals. As an added benefit, it is known to increase milk production. It is sometimes used in water as a completion fluid in petroleum and natural gas operations, as well as being an alternative to sodium chloride in household water softener units. Glass manufacturers use granular potash as a flux, lowering the temperature at which a mixture melts. 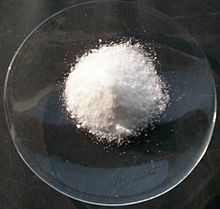 Because potash confers excellent clarity to glass, it is commonly used in eyeglasses, glassware, televisions and computer monitors. KCl is useful as a beta radiation source for calibration of radiation monitoring equipment, because natural potassium contains 0.0118% of the isotope 40K. One kilogram of KCl yields 16350 becquerels of radiation consisting of 89.28% beta and 10.72% gamma with 1.46083 MeV. Potassium chloride is used in some de-icing products that are designed to be safer for pets and plants, though these are inferior in melting quality to calcium chloride [lowest usable temperature 12 °F (−11 °C) v. −25 °F (−32 °C)]. It is also used in various brands of bottled water, as well as in bulk quantities for fossil fuel drilling purposes. Potassium chloride was once used as a fire extinguishing agent, used in portable and wheeled fire extinguishers. Known as Super-K dry chemical, it was more effective than sodium bicarbonate-based dry chemicals and was compatible with protein foam. This agent fell out of favor with the introduction of potassium bicarbonate (Purple-K) dry chemical in the late 1960s, which was much less corrosive and more effective. It is rated for B and C fires. Along with sodium chloride and lithium chloride, potassium chloride is used as a flux for the gas welding of aluminium. Potassium chloride is also an optical crystal with a wide transmission range from 210 nm to 20 µm. While cheap, KCl crystal is hygroscopic. This limits its application to protected environments or short-term uses such as prototyping. Exposed to free air, KCl optics will "rot". Whereas KCl components were formerly used for infrared optics, it has been entirely replaced by much tougher crystals such as zinc selenide. Potassium chloride has also been used to produce heat packs which employ exothermic chemical reactions, but these have mostly been discontinued with the advent of cheaper and more efficient methods, such as the oxidation of metals ('Hot Hands' one-time-use products) or the crystallization of sodium acetate (multiple-use products). Potassium chloride is used as a scotophor with designation P10 in dark-trace CRTs, e.g. in the Skiatron. The typical amounts of potassium chloride found in the diet appear to be generally safe. In larger quantities, however, potassium chloride is toxic. The LD50 of orally ingested potassium chloride is approximately 2.5 g/kg, or 190 grams (6.7 oz) for a body mass of 75 kilograms (165 lb). In comparison, the LD50 of sodium chloride (table salt) is 3.75 g/kg. Intravenously, the LD50 of potassium chloride is far smaller, at about 57.2 mg/kg to 66.7 mg/kg; this is found by dividing the lethal concentration of positive potassium ions (about 30 to 35 mg/kg) by the proportion by mass of potassium ions in potassium chloride (about .52445 mg K+/mg KCl). In such quantities, it has severe consequences on the cardiac muscles, potentially causing cardiac arrest and rapid death. For this reason, it is used as the third and final drug delivered in the lethal injection process. KCl is soluble in a variety of polar solvents. Solutions of KCl are common standards, for example for calibration of the electrical conductivity of (ionic) solutions, since KCl solutions are stable, allowing for reproducible measurements. In aqueous solution, it is essentially fully ionized into solvated K+ and Cl– ions. The crystal structure of potassium chloride is like that of NaCl. It adopts a face-centered cubic structure. 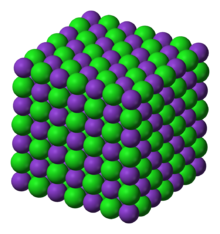 Its lattice constant is roughly 6.3 Å. Crystals cleave easily in three directions. As with other compounds containing potassium, KCl in powdered form gives a lilac flame. Potassium chloride is extracted from minerals sylvite, carnallite, and potash. It is also extracted from salt water and can be manufactured by crystallization from solution, flotation or electrostatic separation from suitable minerals. It is a by-product of the production of nitric acid from potassium nitrate and hydrochloric acid. The vast majority of potassium chloride is produced as agricultural and industrial grade potash in Saskatchewan, Canada, as well as Russia and Belarus. Saskatchewan alone accounted for over 25% of the world's potash production in 2017. ^ "Potassium chloride (PIM 430)". International Programme on Chemical Safety. 3.3.1 Properties of the substance. Retrieved 2011-01-17. ^ "Compound Summary for CID 4873". Pubchem.ncbi.nlm.nih.gov. Retrieved 17 October 2015. ^ Chambers, Michael. "ChemIDplus - 7447-40-7 - WCUXLLCKKVVCTQ-UHFFFAOYSA-M - Potassium chloride [USP:JAN] - Similar structures search, synonyms, formulas, resource links, and other chemical information". Chem.sis.nlm.nih.gov. Retrieved 22 December 2017. ^ "Potassium Fertilizers (Penn State Agronomy Guide)". Penn State Agronomy Guide (Penn State Extension). Retrieved 2016-12-10. ^ a b Burkhardt, Elizabeth R. (2006). "Potassium and Potassium Alloys". Ullmann's Encyclopedia of Industrial Chemistry. doi:10.1002/14356007.a22_031.pub2. ISBN 978-3527306732. ^ Sinopoli, Dominique A.; Lawless, Harry T. (2012). "Taste Properties of Potassium Chloride Alone and in Mixtures with Sodium Chloride Using a Check-All-That-Apply Method". Journal of Food Science. 77 (9): S319–22. doi:10.1111/j.1750-3841.2012.02862.x. PMID 22901084. ^ Nutrition, Center for Food Safety and Applied. "GRAS Substances (SCOGS) Database - Select Committee on GRAS Substances (SCOGS) Opinion: Potassium chloride". www.fda.gov. Retrieved 21 June 2017. ^ Bhatkhande, C.Y. ; Joglekar, V.D. (1977-01-01). "Fatal poisoning by potassium in human and rabbit". Forensic Science. 9: 33–36. doi:10.1016/0300-9432(77)90062-0. ISSN 0300-9432. ^ "Molecular weight of KCl". www.convertunits.com. Retrieved 2018-11-04. ^ "Potash Mineral Commodity Summaries 2018" (PDF).